Despite having a long history in petroleum production – and being the place where the anticlinal trap was first recognised – there is much left to learn about the geology of Myanmar and its remaining hydrocarbon potential. Modified from Metcalfe, 2017. On a clear day a landscape littered with buildings covered in glittering gold facades greets you when flying into Yangon, the old capital city of Myanmar. This pays homage to the original Mon name of Suvannabhumi, which directly translates into the tag line of the country – ‘The Golden Land.’ The gilded temples are covered in real gold and often numerous jewels. For example, the largest temple in Yangon, the Shwedagon Pagoda, is covered in 27 tons of gold, 5,000 diamonds and 2,000 rubies, mostly sourced from precious gem mines in the country itself. These gems have long been mined in Myanmar, most specifically from marble gravels in the Mogok Region, often referred to as the ‘Valley of Rubies,’ in the central north-east of the country. They are considered some of the finest in the world. The country is also famed for its gold reserves, cretaceous amber, and the rare tropical wood (e.g., teak and rosewood) that grows there. In addition, its vast hydrocarbon reserves lead to a great future exploration potential. The volcanic plug Taung Kalat rises sharply to a height of 657m and is topped by a Buddist monastery. Image credit: Conor McMillan. Myanmar sits to the east of the India–Asia collision zone, where the Indian Plate is obliquely subducting beneath the West Myanmar Block. The country is subdivided into three north–south trending belts: the accretionary prism of the Indo Myanmar Ranges in the west; the central depression of the Central Myanmar Basin, where most of the known onshore petroleum reserves are located; and the Sino Myanmar Ranges, which include the precious gem-rich Mogok Region. 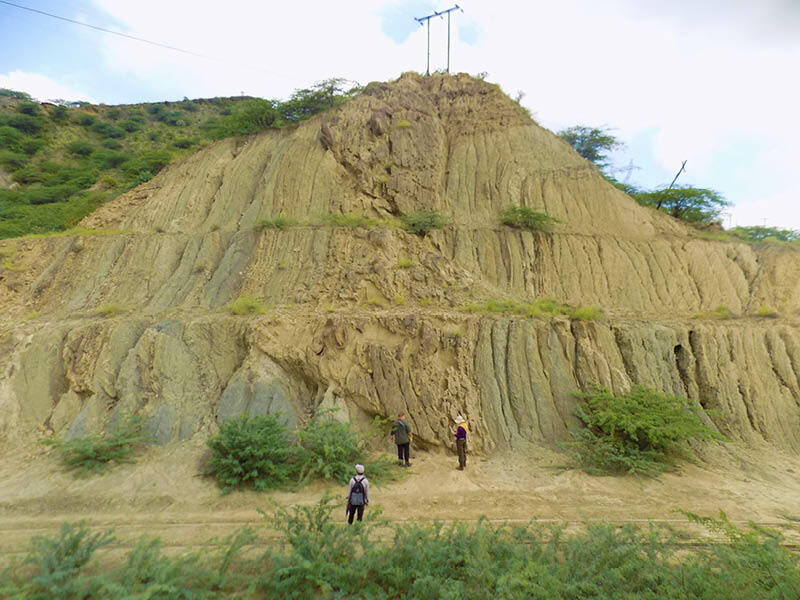 Another notable feature is the partially buried Wuntho–Popa magmatic arc that dissects the centre of the Central Myanmar Basin in a north–south orientation. 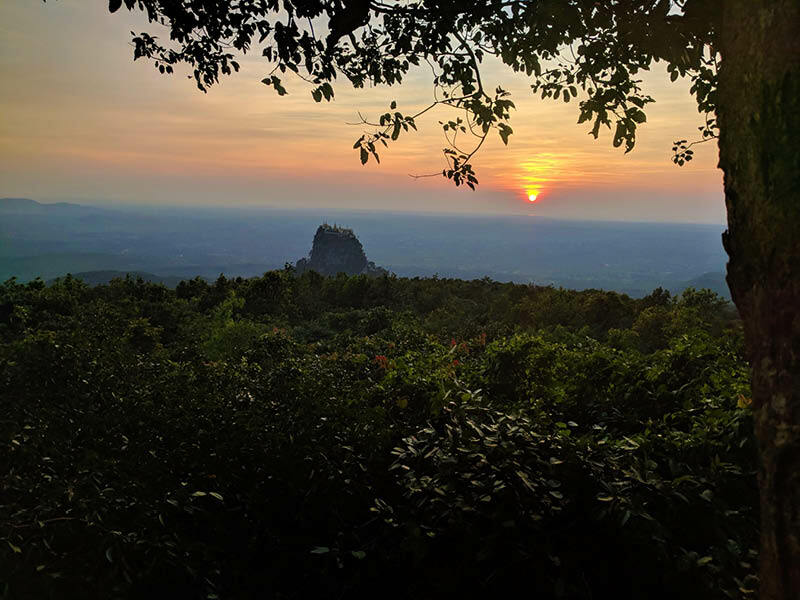 A large pagoda has been built on the flat top of Taung Kalat, a volcanic plug related to the extinct Mount Popa. The timing of the uplift of the Indo Myanmar Ranges is still an area of dispute, with some people arguing for an early Cenozoic age and others proposing that it is as young as 5 Ma. This affects the sediment routing through the Central Myanmar Basin in the Cenozoic, and the timing of any deflection or distribution of the sediments that were deposited in the actively producing offshore oilfields in the west. This is important, as the Cenozoic sediments in the Salin Subbasin of the Central Myanmar Basin are extensive and exceed thicknesses of 18 km (Hall and Morley, 2004), suggesting a high sediment yield was sustained for a long period of time. Abundant load and flame structures are common throughout the Cenozoic deposits and can be related to a high sediment supply and concurrent rapid deposition. Sediment provenance studies onshore in the Central Myanmar Basin can help to answer some of these questions. A Yenangyuang oil well dug by hand using metal-tipped bamboo rods attached to a small generator. Image credit: Amy Gough. From the construction of the walls of Babylon to salt production in ancient China, humans have been utilising petroleum reserves for over 4,000 years. Myanmar is no exception, with hand-dug wells dating back to 900 BC (Thornton, 2015). Exploration and production carries on into the current day. Currently, Myanmar has 51 onshore blocks in operation, 18 of which are offshore, mostly producing natural gas (MoEE, 2018). The Ministry of Electricity and Energy (MoEE) reports proven reserves of 16.6 Tcfg (CEIC, 2018) but this leaves room for many more substantial finds. In addition, Myanmar derives energy from a range of renewable sources, with solar panels and hydroelectric plants being a common sight across the country. The city of Yenangyuang, Central Myanmar, has been built on the petroleum industry: in fact, the very name is directly translated as ‘stream of oil’. 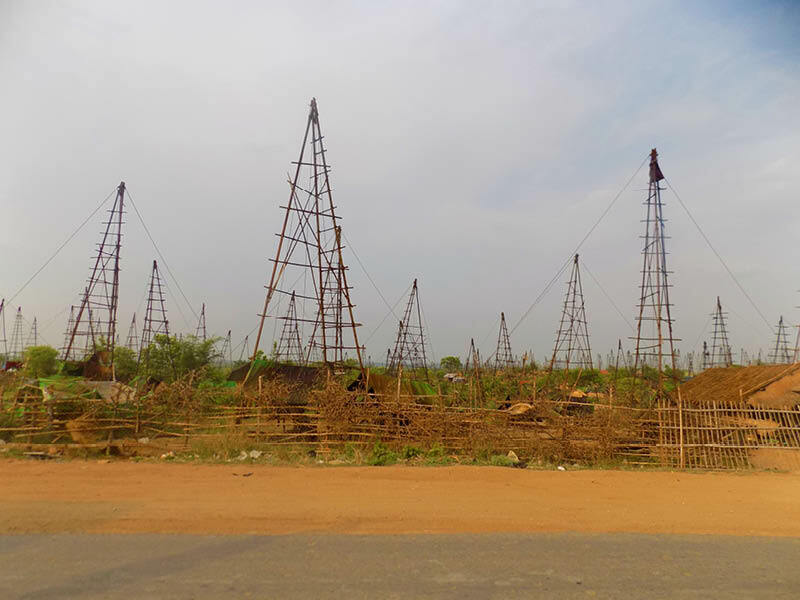 The modern-day landscape is littered with thousands of pyramidoidal bamboo frames marking the location of hand-drilled oil wells. The luckiest villagers will strike oil close to surface, but some of the wells can reach more than 460m in depth. They are mostly drilled by using metal-tipped bamboo rods attached to car engine-sized generators, and the oil extracted by lowering long plastic pipes down the well and winching the reserves back up to surface. There are also smaller operations, where one person uses a hand-winch and plastic bottles cut to act as a receptacle to extract the petroleum. Hand drilled oil wells dug by villagers in the Mann Field, Central Myanmar. Image credit: Amy Gough. Still forming a prominent industry for the people of Myanmar, these operations have been ongoing in the Yenangyaung area since at least the 1750s (although the field was only officially ‘discovered’ in 1889). George Baker, a British captain, recorded the location of similar hand-dug wells in the area, and it has remained an area of interest for exploration into the modern day (Longmuir, 2008; Racey & Ridd, 2015). Interestingly, the Yenangyaung field is considered to be the first place that the anticlinal theory of petroleum accumulation was identified, in 1855 by Anglo-Irish geologist Thomas Oldham when he was working for the Indian Geological Survey – a fact that the geologists who work on the field for the national oil company, MOGE, are incredibly proud of. Oldham recognised that the local villagers were only digging for oil on the crest of the highest part of the anticline and made the connection between this and structural traps. After the official ‘discovery’ of the field in 1889, ‘Well One’ was drilled. It was completely dry, mainly because it was too shallow. Further efforts of exploration have, however, proven to be highly successful, with a derrick actively producing directly next to this initial ‘Well One’. 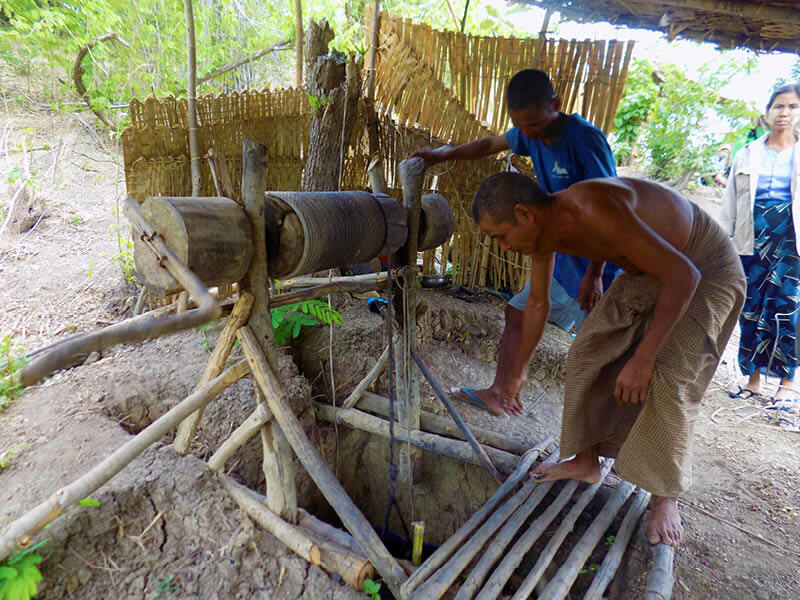 The field is now officially owned and run by MOGE, but many villagers still hand-drill and produce oil in the area. Many other fields have the potential to be as productive as the Yenangyuang field, but further research and exploration efforts are required. 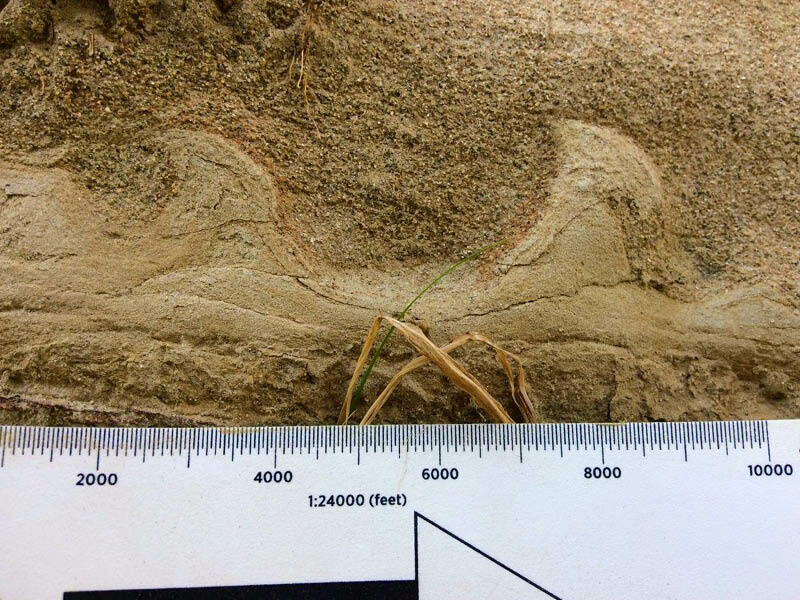 A 3 cm- wide load structure found in Cenozoic deposits indicates high sediment supply with concurrent rapid deposition. Image credit: Amy Gough. Despite this long history of reserves and exploration, fieldwork-based studies are relatively limited in Myanmar. The South East Asia Research Group (SEARG) have been on the ground in the country since 2013. A combination of geological mapping, sedimentological logging, sampling, and subsequent analysis through petrology, XRD, heavy mineral analysis, and U-Pb dating of zircons has allowed us to make some interesting discoveries about this unique and dynamic country. 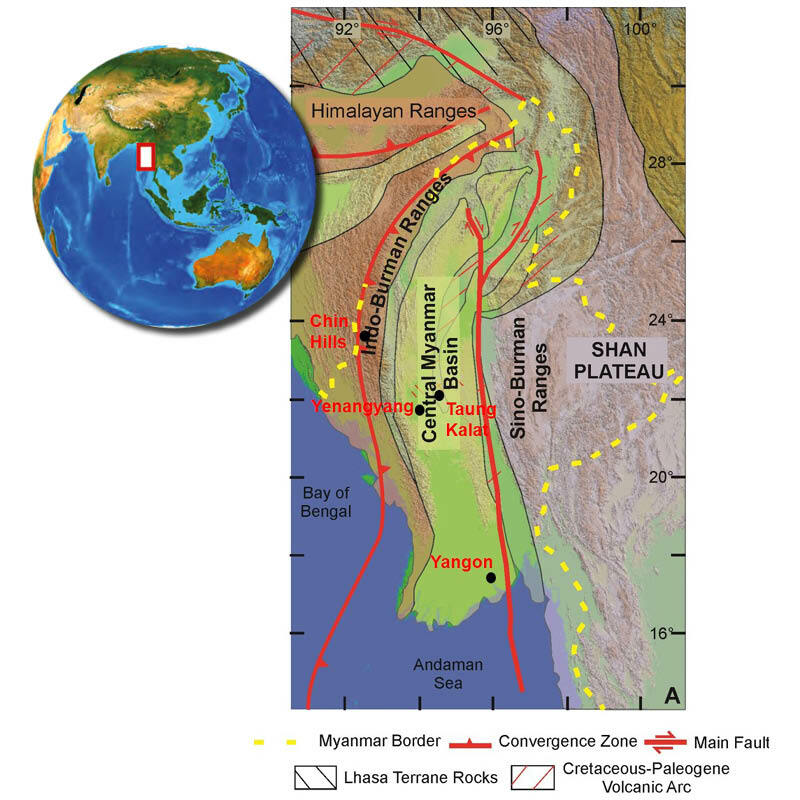 For example, analysis from the Chin Hills area suggests that the West Myanmar Block was tectonically already part of Asia from the Mesozoic (Sevastjanova et al., 2016). SEARG have more recently found that the sediment routing pathways in the Central Myanmar Basin are a lot more complex than previously thought, with sediment sources in the Indo-Myanmar Ranges to the west and from the magmatic arc to the east (McNeil et al., in prep). A typical outcrop of marine Oligocene sediments. Image credit: Amy Gough. This has enabled us to revise the Cenozoic sedimentology in the hydrocarbon-bearing areas (Gough & Hall, in prep). For example, a spatially dense logging campaign allowed for facies associations and architectural elements to be studied through the Oligocene, and it was found that the fluvio-marine environments show that marine incursions transgressed further into the basin than previously thought. Further studies into the sediments of the Central Myanmar Basin will help us to better understand the geological history of the area and the numerous hydrocarbon plays found throughout the country. The growth of energy use in South East Asia is generally considered to currently be unsustainable. Consumption in Indonesia, for example, has started to out-pace production, relying more and more on imports to keep up with demand (PWC, 2018). Areas like Myanmar, with plentiful potential reserves, could help this potential energy crisis with ongoing efforts in exploration. Hall, R. and Morley, C.K., 2004. Sundaland Basins. Continent-ocean interactions with East Asian marginal seas: American Geophysical Union Monograph, 149, pp.55-85. Longmuir, M.V. 2001. Oil in Burma, the Extraction of ‘Earth-Oil’ to 1914. White Lotus, Bangkok. McNeil, J., Gough, A., Hall, R. Sediment Provenance of the Oligocene Formations of the Salin Sub-Basin, Myanmar. In Prep. Ridd, M.F. and Racey, A., 2015. Historical Background to Myanmar's Petroleum Industry. Geological Society, London, Memoirs, 45(1), pp.13-20. Sevastjanova, I., Hall, R., Rittner, M., Paw, S.M.T.L., Naing, T.T., Alderton, D.H. and Comfort, G., 2016. Myanmar and Asia united, Australia left behind long ago. Gondwana Research, 32, pp.24-40. Some recommended GEO ExPro articles relating to, or similar in content to, oil and gas exploration in southeast Asia. With significant population and economic growth in the ASEAN countries, there is an urgent demand for new resources to feed this and future development and reduce dependence on coal and imported oil. Doubling hydrocarbon production in 2022 as the giant Miran-Bina Bawi project ramps up.